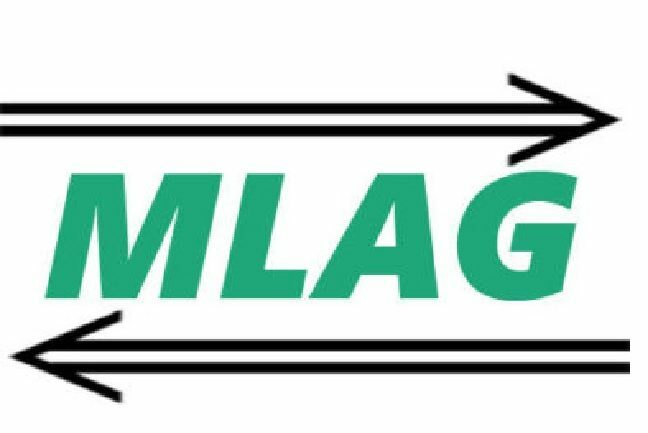 The MarshLink Action Group (MLAG) has released two detailed reports on presentations to the MLAG Open Meeting on 29 November (so primarily aimed at those who were unable to attend the meeting): the first on Southern Railway’s presentation, the second on the results of MLAG’s survey immediately following the introduction of the new timetable in May. Rye could be an even more wonderful place! We start our ‘journey’, our ‘train of thought’, with the general proposition that individuals and communities prosper when they are well-connected with other centres, and by attractive journey times. Be it employee-to-employer, business-to-business, student to school/college, residents to retail/leisure/cultural centres – better links open up access to better opportunities for economic and social development for people and places. That is no more than the lesson of history down through the centuries. For a variety of reasons, not least environmental, contemporarily we much prefer such better links to be rail-based rather than road-based – although local roads are still the vital veins even if rail lines are the arteries. If attractive journey times, by rail, to the country’s largest multi-choice centre, the capital city, are a primary target then the counter-intuitive, less-geographically-direct route via Ashford is the preferred route, as on analysis only it has the potential to offer the step-change in journey times which will enable Rye, and other places served such as Hastings, St. Leonards and Bexhill, to prosper and thrive. 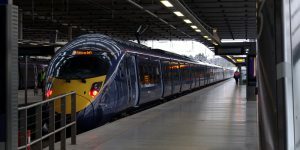 If journey time improvement is the guiding principle, we see that since May the new Southern timetable, with some refinement in December, is already delivering a step one change by reducing connecting times into and out of St. Pancras services at Ashford. That affirms our ‘journey’ as a sequence of steps, not a single leap. Step two is under design development by Network Rail now, to identify the best way to achieve simultaneously two improvements at Ashford station. 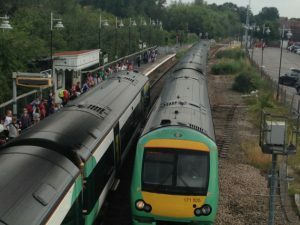 One is to access a third platform in addition to platforms 5 and 6 which can be used by Javelin trains, especially those serving the south Kent coast Channel port towns, to ease congestion of trains on tracks and of passengers on platforms and stairs, and improve operational performance; that may well be platform 2, giving Marshlink passengers a convenient cross-platform interchange. The other improvement, of longer-term benefit, is a new track connection between Marshlink and HS1. A costed design due in February is likely to have a price-tag attached at the thick end of c.£25 million, for which an investment case still has to be made to a range of potential private as well as public funders/financiers. Meanwhile the all-important step three awaits similar development, but we should be under no illusions about the cost of that exercise. With the potential to take up to 13 minutes off the Eastbourne – Ashford journey, fully half of which would just be between Rye and Ashford, a Marshlink improvement programme is already costed at c.£100-£150 million. If a £25 million project needs a £200,000 study, on a pro rata basis a £100-£150 million project may need c.£0.75 million to fund its study to produce a costed detailed design! A second hourly ‘fast’ train? The package of Marshlink improvements would enable not just quicker journeys but a new additional hourly service to maximise the benefits of the quicker journeys; as well as an hourly all-stations local service, a fast limited-stop service using conventional trains and calling only at Rye between Ashford and Hastings would develop the market and build the basis for through London services. Works would have to include the diversion of Highways England’s A259 north-east of Rye at East Guldeford to eliminate two high-risk level crossings (and provide a more direct road route), increased line speeds from 40 mph to 60 mph between Ore and Doleham and from 60 mph to 90 mph between Doleham and Ashford, via an extended passing loop with re-doubled track on both sides of Rye to enable trains to pass on the move rather than be held up waiting in Rye station for the other’s arrival from a single-track section. Only at journey’s end might we then reach the possibility of a final step four, namely through services built on steps two and three and directly connecting Eastbourne, Bexhill, St. Leonards, Hastings, and Rye via Ashford with London St. Pancras. That may very well be a separate step as again it will require a major capital and ongoing revenue investment, by a train operating company, in acquiring and operating sufficient additional, HS1-compatible, new trains for which a viable business case would have to be established. Conspicuous by its absence from both steps three and four is any mention of the ‘e’ word, or of any other means of propulsion of future trains across the Marshlink, be they the hourly all-stations stopping service between for example Ashford International and Hastings, a new hourly fast limited-stop service between Ashford International and Eastbourne, or a new hourly fast limited-stop HS1 service between St. Pancras and Eastbourne. Within the realistic longer-term timescales which steps three and four inevitably and unavoidably involve, train traction technology will advance (think Formula E motor racing) as will the ways in which new trains are specified and procured. Ultimately those will be matters decided by national bodies – central government and Network Rail – and commercial bodies – train operating companies – based on the usual tests of value-for-money and affordability. Meanwhile the common thread is that the biggest single contribution which the passenger railway can make to securing a palette of environmental gains is to facilitate the progressive transfer of a greater share of personal journeys from road to rail. 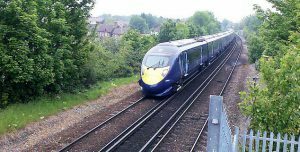 An all-day/every-day half-hourly train service between Ashford, Rye and Hastings, with more attractive journey times, is the vital key to unlocking that prize. In that context the particular train traction technology adopted for Marshlink assumes far less significance, and for now remains unknowable. The frequency of opportunities to travel, time-efficiently, and with expeditious connections where necessary, are the strategic policy ‘end’ for us to pursue; propulsion is a tactical operational ‘means’ – which in reality is not directly critical to achieving any of those three aims! At each step along the way progress can be made through maintaining a strong multi-agency, cross-sector, and all-party partnership. As well as existing institutional structures, the new sub-national transport body Transport for the South East will be the organisation through which to articulate the benefits of a bigger better railway for the communities of the east of East Sussex. St. Leonards Warrior Square on 25% has even less season ticket use than Rye. Its high proportion of other ticket types points to its success as a visitor destination, a role which improved rail services can only support through increased spend in Rye’s local economy of ‘the visitor pound’. Image Credits: MLAG, Rye News library. You might find number of people travelling on season tickets from Rye is so low because most people get season ticket from Bexhill. As it is cheaper for non HS1 travel and is more flexible if you need to travel via other routes. If Roger was Rye commuter he would have know this. What I would like to know is what is happening about Javelins into platform two at Ashford International. Peter Chowney (Labour) has thrown down the gauntlet saying that this has been quashed. No one has denied that thesis the case. My feeling no smoke without fire! I feel the longer this report takes to publish the less likely this wonderful idea is likely to take shape.